Concerns have been raised over the future funding of a replica Pilgrim Fathers ship being built in Plymouth. Plans for the �2.5m project, put forward by local businessman Chris Parsonage, have yet to be finalised. A lot of the funding is expected to come from interest in the project from television companies in America and Britain. But local tourism lecturer Win Scutt said maintenance costs after the vessel had been built could prove problematic. "To have a ship built like this in Plymouth is really fantastic news. "But whether it will be viable remains to be seen as these things cost a lot of money," said Mr Scutt, who lectures at the College of Further Education in Plymouth. "Even when you have built it, you have got years and years of maintenance to keep it going. "I hope the project organisers have looked very carefully at their sums, because if they have and they have got it right, it will be fantastic news for the city." 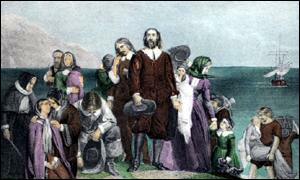 The Pilgrim Fathers left England in the Mayflower in 1620 and crossed the Atlantic to reach the shores of the New World. The plans to build a replica of the famous three-masted vessel has been supported by Plymouth City Council. Council leader Kevin Wigens said he had every confidence in the team behind the project. "Chris Parsonage's team have researched this over the last couple of years. "I understand the funding is in place. The television interest in this project is immense and I am sure it will be very successful." Planning has passed the initial stages, but the boatyard to take on the project has yet to be finalised, even though building work is set to start in March. The project consultants are yet to decide whether actors will be used to describe life on board the ship. But they hope some of the extra money needed for the project will come from tourists, educational outlets and corporate business.